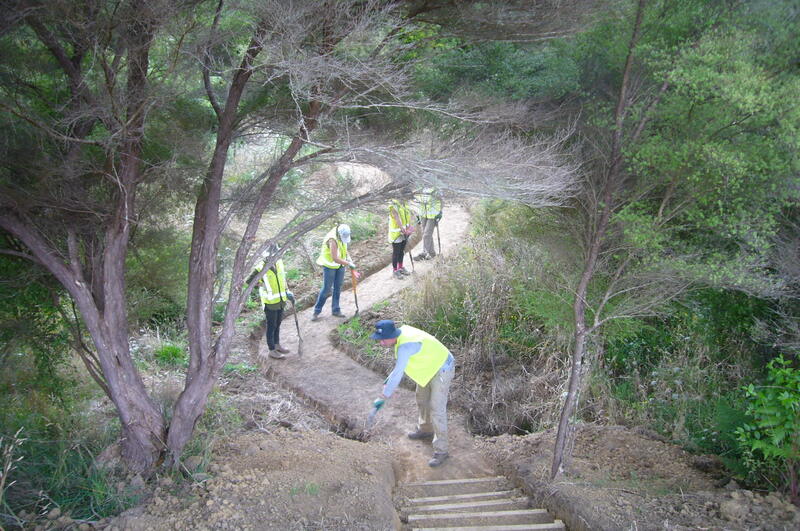 The walking track at CUE Haven came a lot closer to being finished thanks to the efforts of a small but hard working team of Conservation Volunteers. 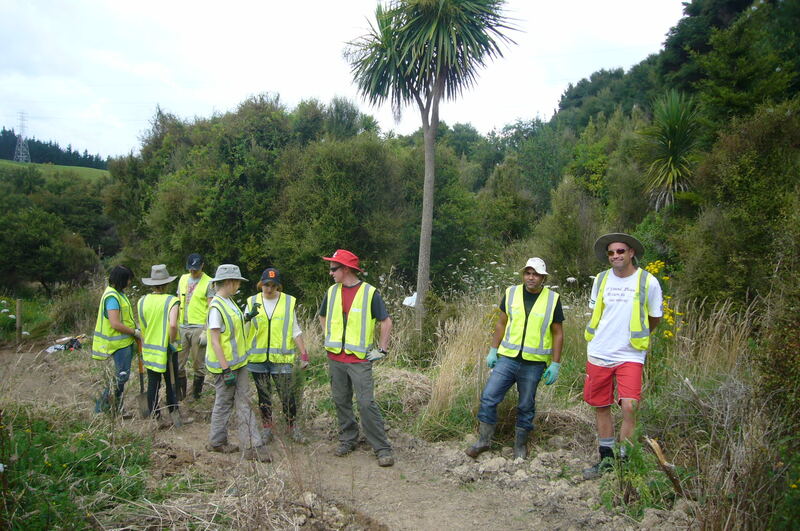 In addition to a group of five volunteers who spent the week with us, we also had a few local volunteers who came out for the day to help out. 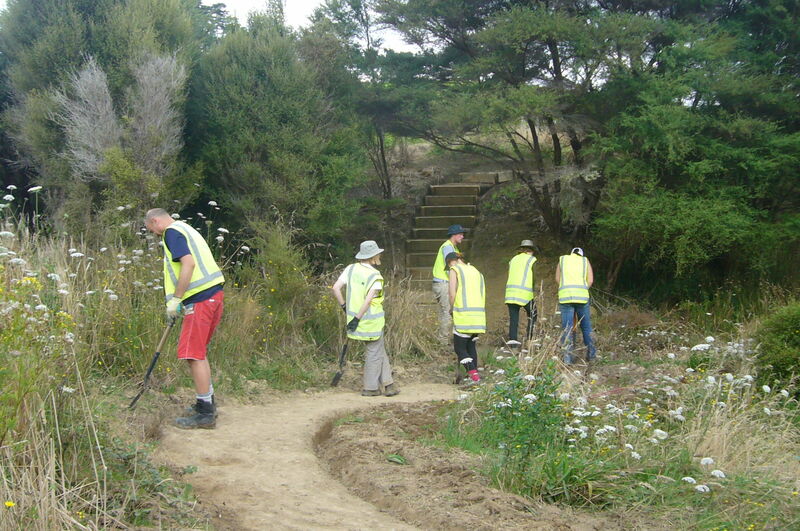 We started the walking track in October and over the past few months teams of volunteers have been extending and improving it and we are now in sight of the finishing point. 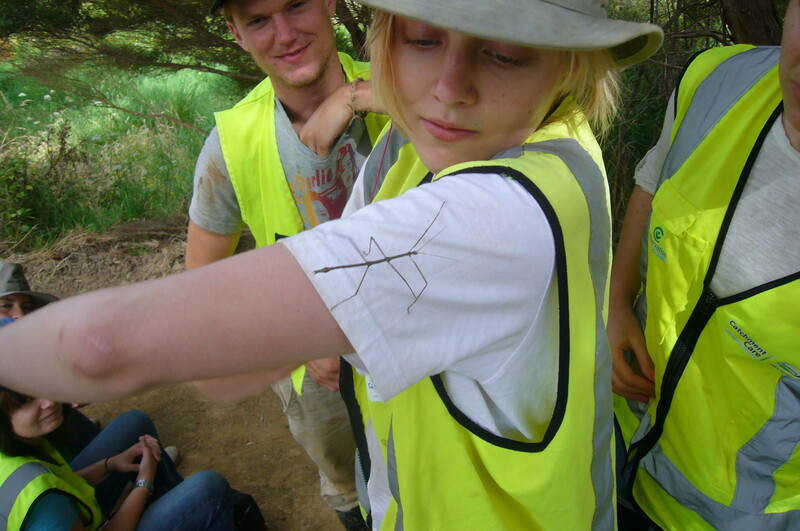 One of the main obstacles facing us was a swampy area that we couldn’t go around. The only solution was a causeway bridge over the wet area. 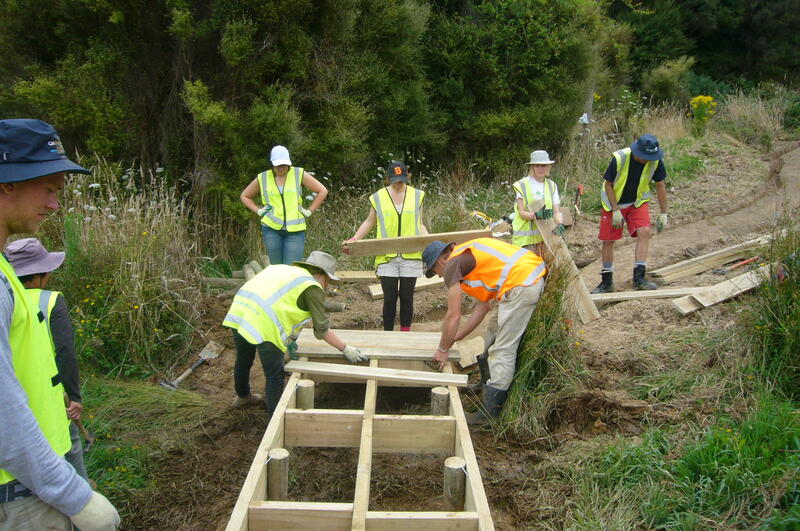 The team this week built the bridge, installed a number of steps and generally improved the layout and drainage of the track. 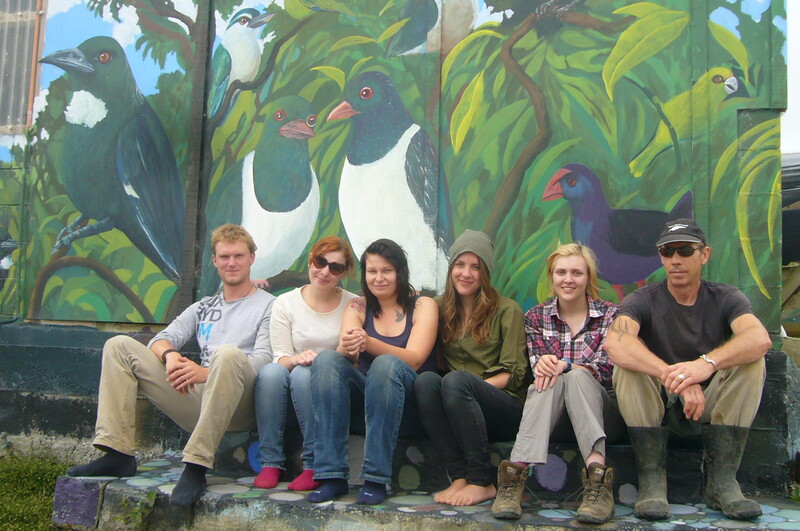 The core team, made up of Kayleigh from Wales, Katherine from England and Rebekka, Jill and Harald from Germany, arrived on Monday morning. 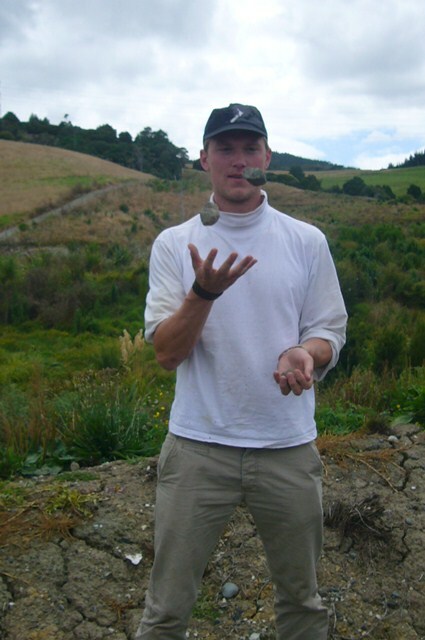 John Busson of CVNZ was the team leader. 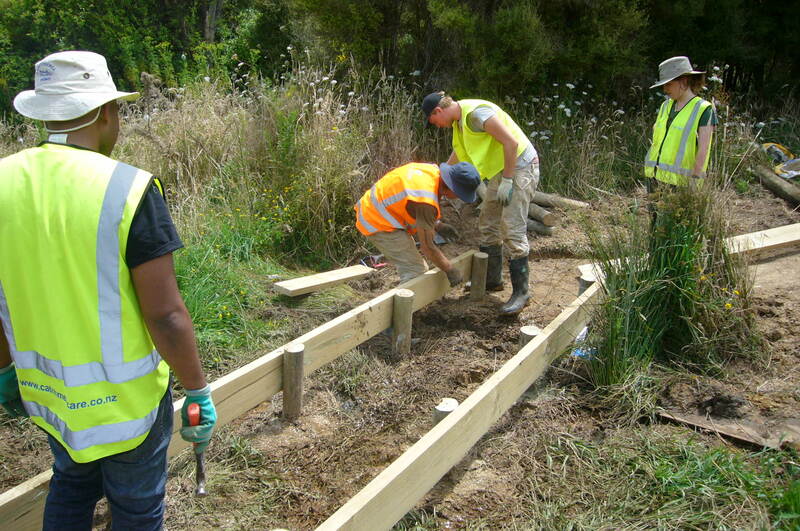 The last group to work on the track had cut out several steps and the first task was to box them in. 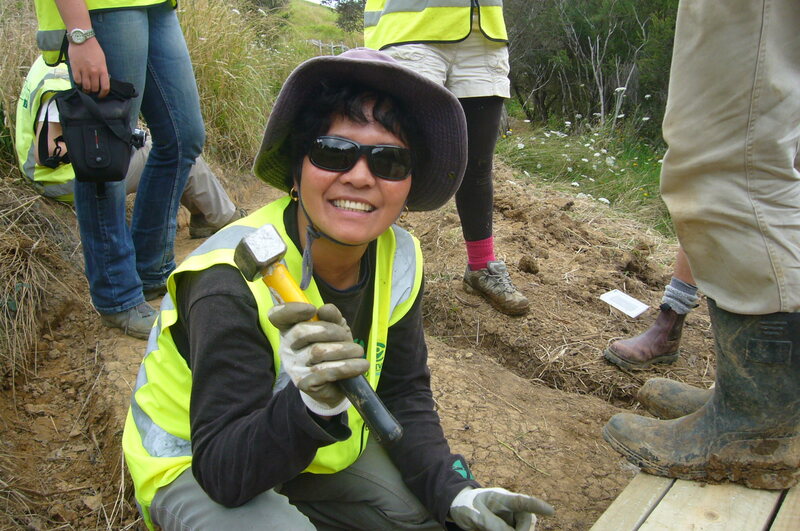 The job required hammering stakes into the hard ground and the team members took turns. 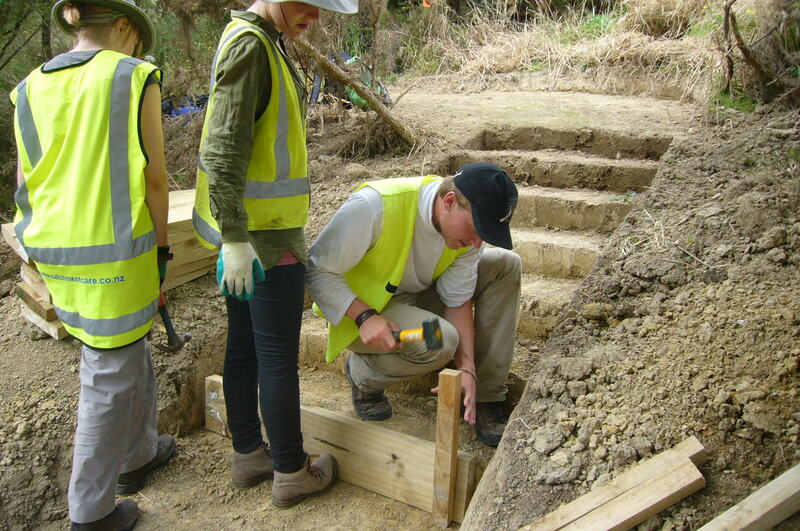 On Tuesday, we continued to box up steps. 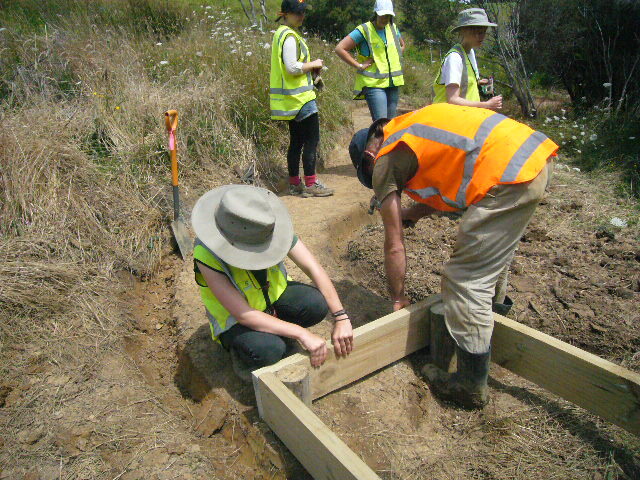 Aucklanders Maggie, Ed, Jean-Pierre and Jean-Luc also joined the team for the day and they worked on improving a section of low lying track by covering it with soil excavated from other parts of the track. 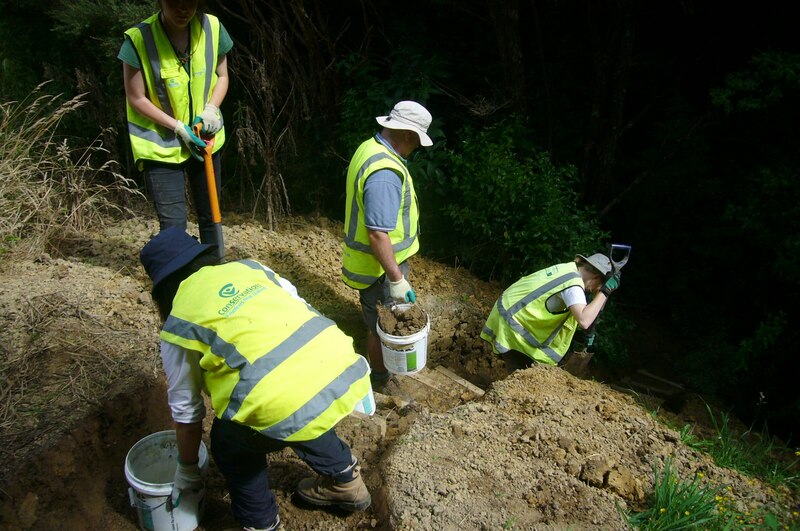 The group also worked on levelling off sections of the track and digging out drainage ditches. And took a well deserved rest! 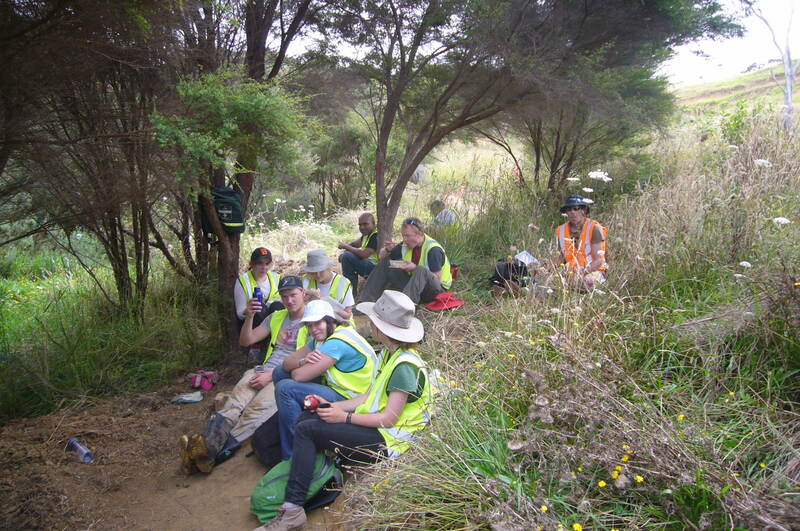 The hard working team even ate their lunch in the field. 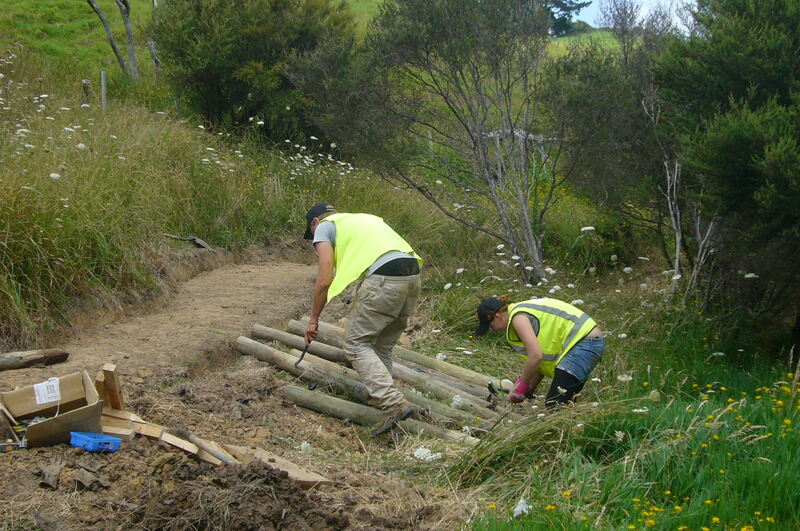 While most of the team continued to work on improving the track, John and Harald went ahead to start on the bridge. 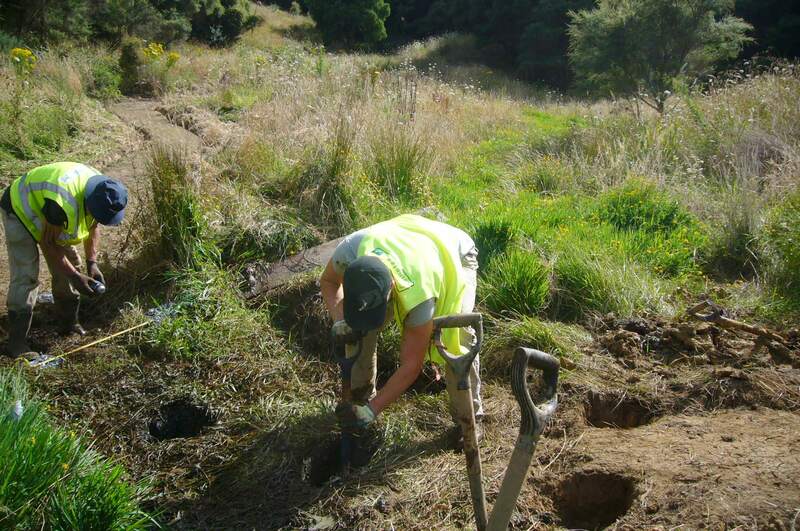 The area is always wet and in the wet winter season there is a substantial amount of standing water. We used high and low water marks to determine the optimal length and height of the bridge. 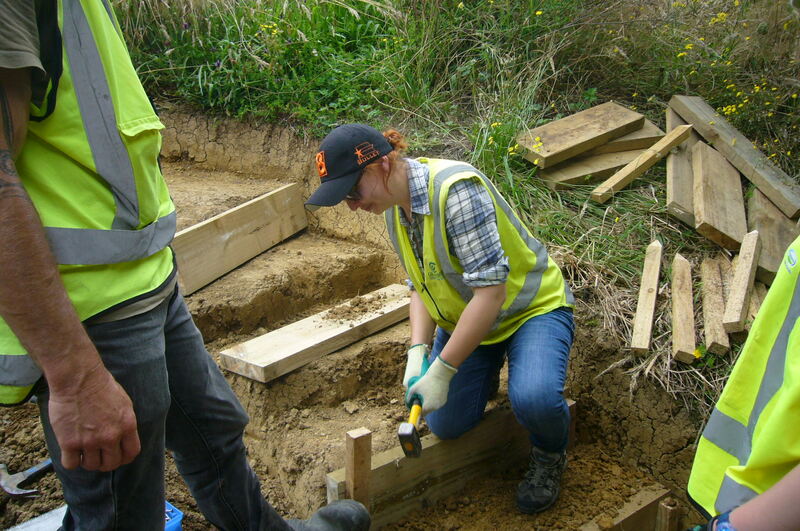 The first task was to dig holes for the footer posts. 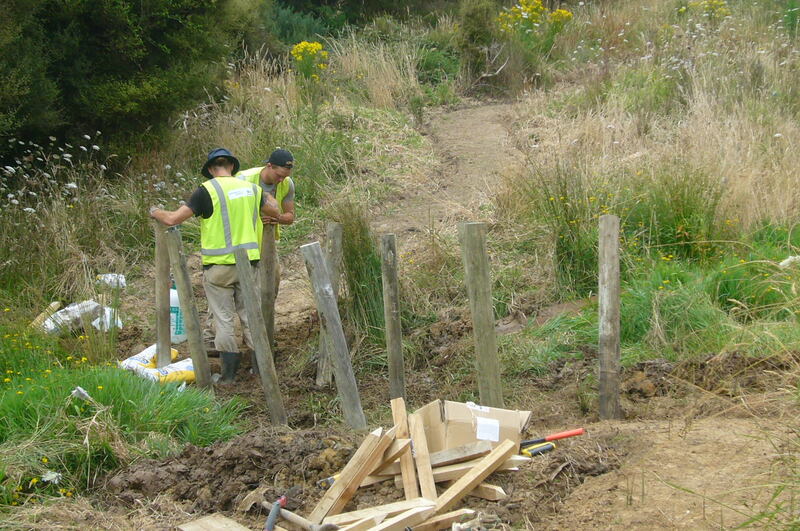 In order for the bridge to be secure, the posts had to be set in concrete. 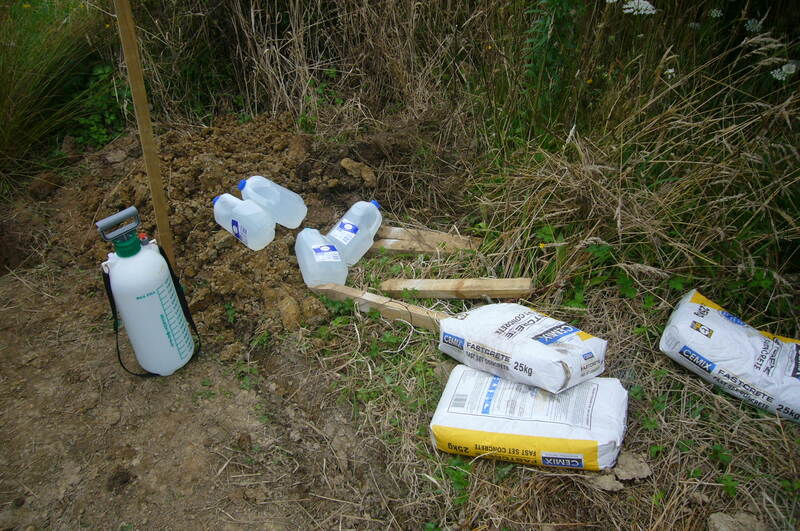 The team had to carry up 25 kg bags of cement as well as clean water. 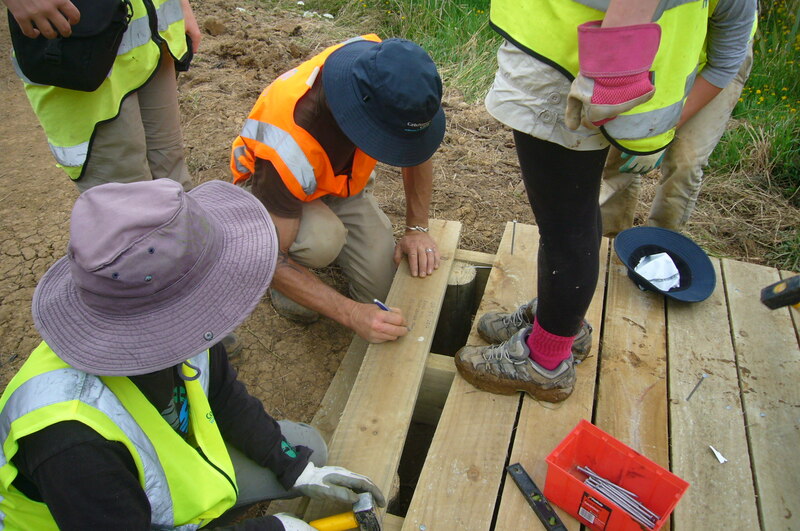 The next day, after the concrete had set, we cut off the tops of the posts and began to assemble the bridge. 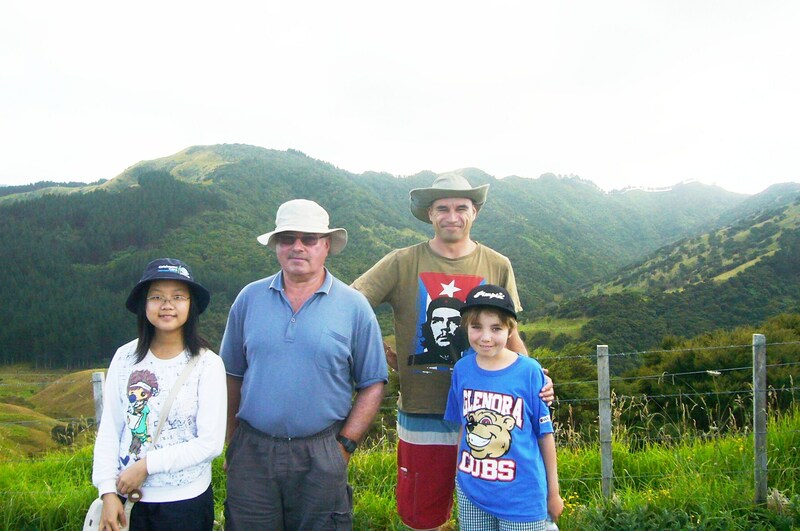 We were joined by Auckland volunteers Jean-Pierre, James and Moloy. 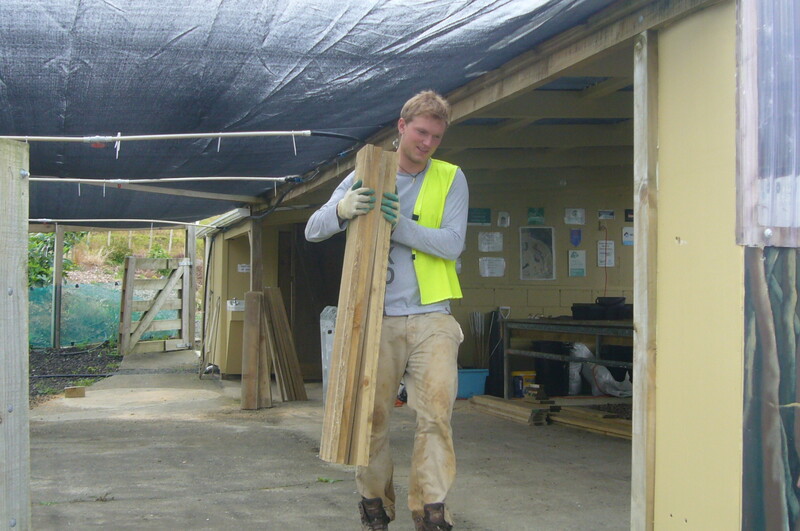 Once the framework was in place, we knew the exact dimensions of the bridge and were able to cut the top planking boards down in the nursery. Thursday morning the team was joined by Fe and Jean Pierre. 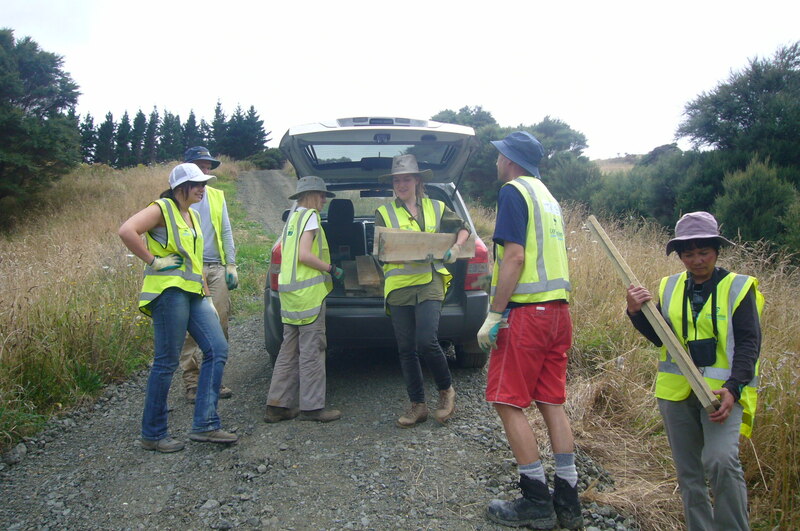 We took the planks up to the end of the road where the track will eventually finish and the team carried them down to the site. 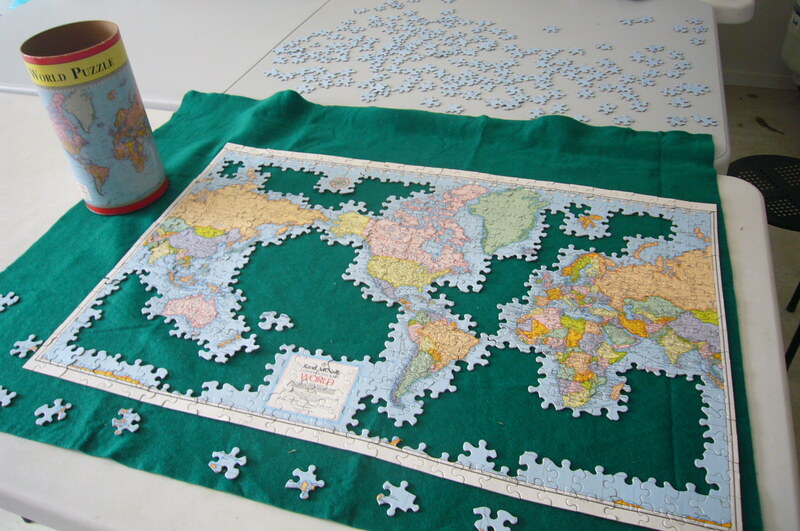 The next job was to carefully position the planks to make sure everything was even. 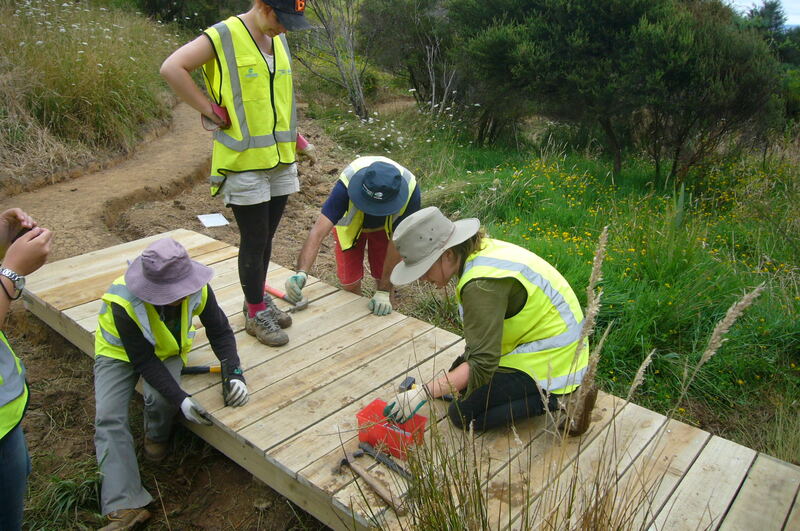 Everyone then took turns nailing down the planks. 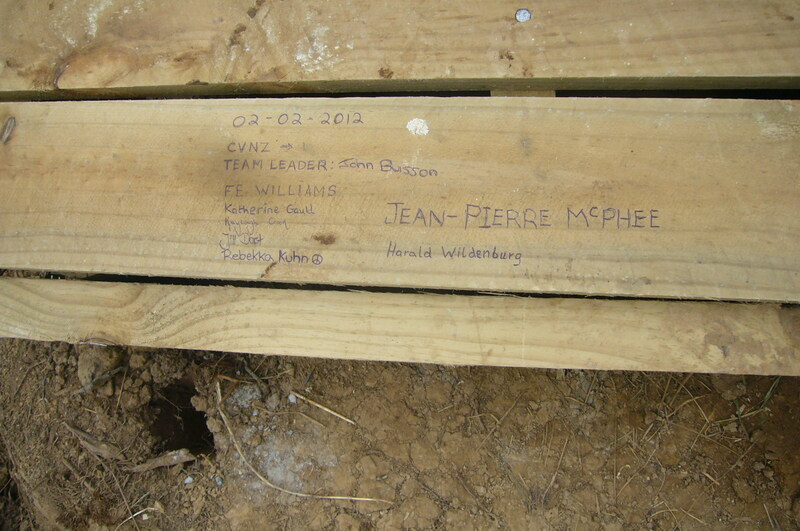 Before we nailed the last plank in place, each of the team members signed the board to commemorate their involvement in the construction. 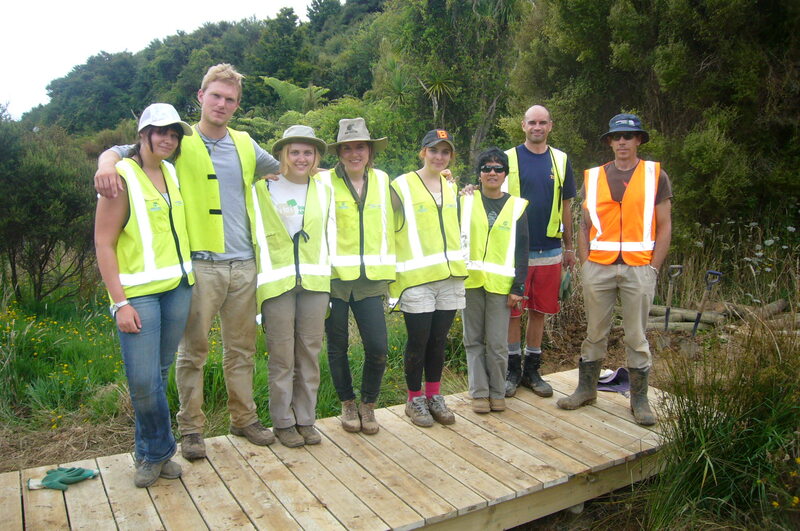 The team then tested out the strength of the bridge by posing for a group picture. 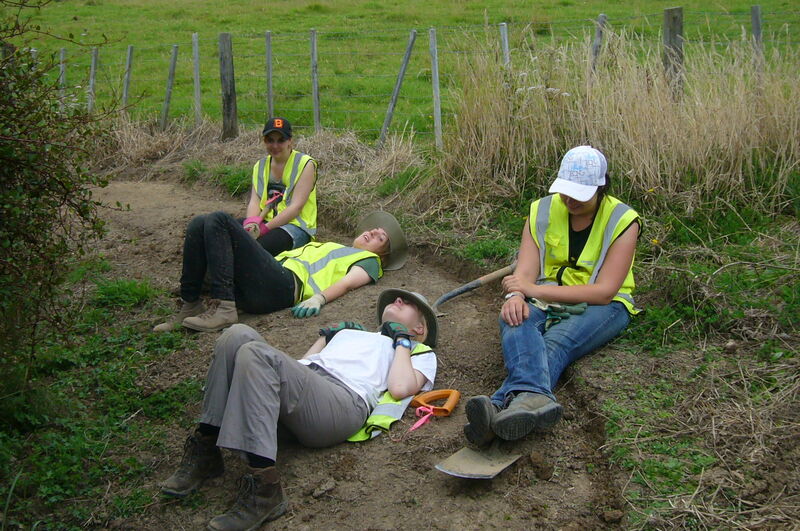 This week involved a lot of hard work but the team was really enthusiastic and dedicated. 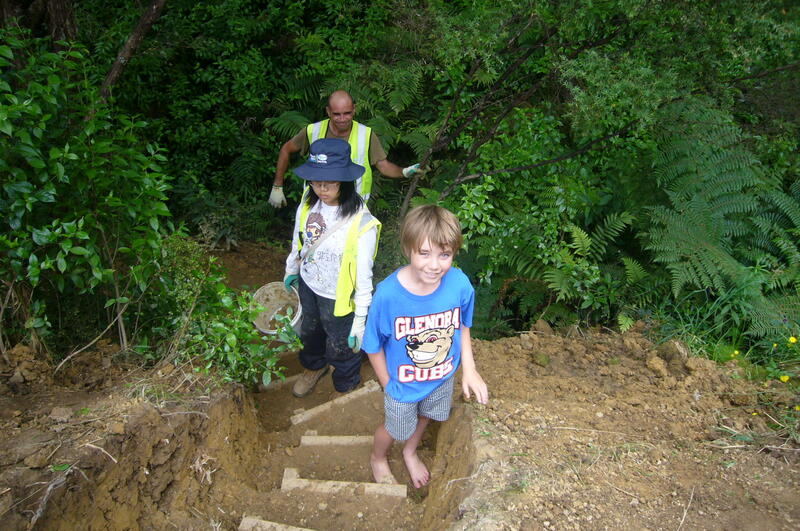 Thanks for all your hard work and we hope you will come back to walk the finished track some day! 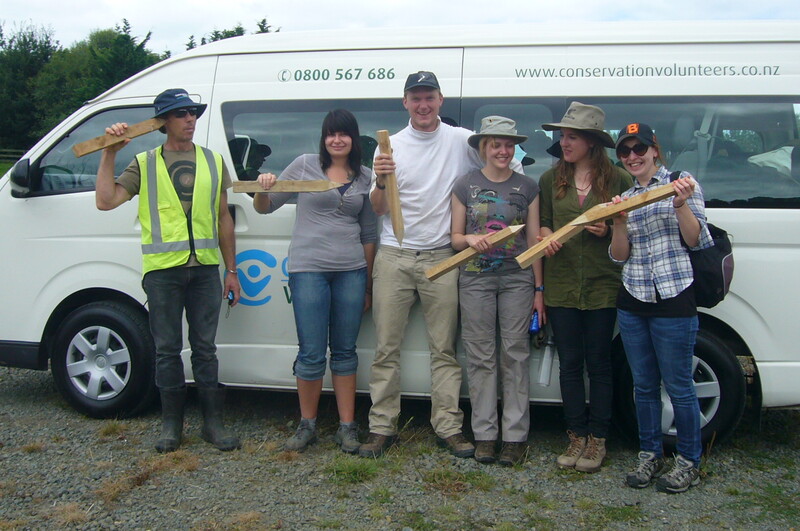 We promised the team that they would learn some new skills during the week and one thing they learned is that wooden stakes can be used for more than killing vampires! 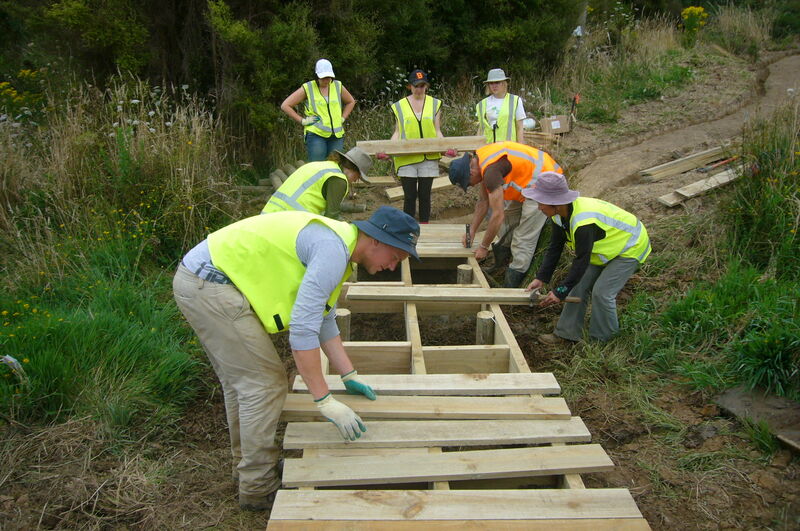 Great acknowledgement for all the effort you took to build the bridge! Despite of all the work you seem to enjoy. That´s fantastic! Good luck for the future projects! Thank you for your comment. 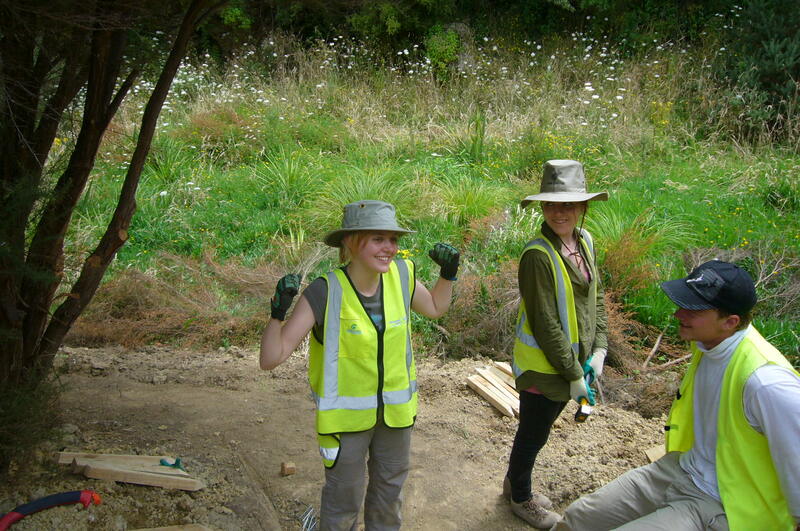 We enjoyed having Rebekka at CUE Haven and we hope that she will come back some day with you and your family so that you can see the project (and the bridge) first hand.